Savvy Spending: Enter to win Starbucks for Life plus other prizes! Play daily through 12/31! Enter to win Starbucks for Life plus other prizes! Play daily through 12/31! 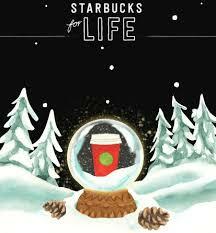 Now through December 31st, Starbucks Rewards Members can enter to win Starbucks for Life! Just log into your Starbucks Rewards account and then click back here and fill out the required information to get a FREE code via email. You can request 2 FREE codes each day! Then click the link you'll receive to play daily!